We are enhancing the way people see and experience art by bridging the gap between art and technology. Storytelling, AR, user interaction and AI features will let a single piece of artwork live on for years to come as this brand evolves. The art is real, but the rest is magic. Today, ScanScapes Technologies introduces ARtscapes, artwork that comes to life via augmented reality, to Kickstarter. ARtscapes offers a variety of canvases in three sizes and an app available on iOS and Android devices that scans the pieces and launches an AR experience. ARtscapes canvases are made of high quality, museum-grade canvas material and ink. Canvas’ are built on sturdy frames with 1.25” gallery depth thickness. ARtscapes offers a large variety of premium art that covers contemporary, impressionism, kids, pop art, abstract, whimsical, surrealism and more. All canvases are available in small, medium, or large sizes. With the free ARtscapes mobile app, users can easily scan each art piece and partake in augmented reality experiences through the artwork on their walls. Without incorporating augmented reality elements, ARtscapes would just be a traditional, still canvas. Rather than creating an entirely new, fictional experience from scratch, like virtual reality does, augmented reality takes an existing experience and overlays exciting new elements to the image. Now, a painting will come to life and begin to tell a story through 2D and 3D animations, movement, sound and other interactive components. The mobile app will be updated frequently to showcase new experiences so that almost every ARtscapes experience will be different even if the canvas remains the same. ARtscapes is currently available on Kickstarter starting at $89 for a small canvas (16” x 20”). For more information or to pre-order, visit pr.go2.fund/artscapes. 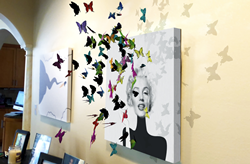 According to ScanScapes Technologies, image-based augmented reality targets are best achieved with static images that are stationary, like wall art, leading them to create ARtscapes. The name ARtscapes reflects its two main features: art — the high quality canvas that looks good on a wall year round, and “scapes” — the magic that users experience from scanning the art. CEO Robert Ramey notes that ARtscapes was the perfect, unlimited creative outlet for him; imagination, creativity and building something new are three things that drive his enthusiasm. For more information about ScanScapes Technologies, visit https://producthype.co/artscapes.